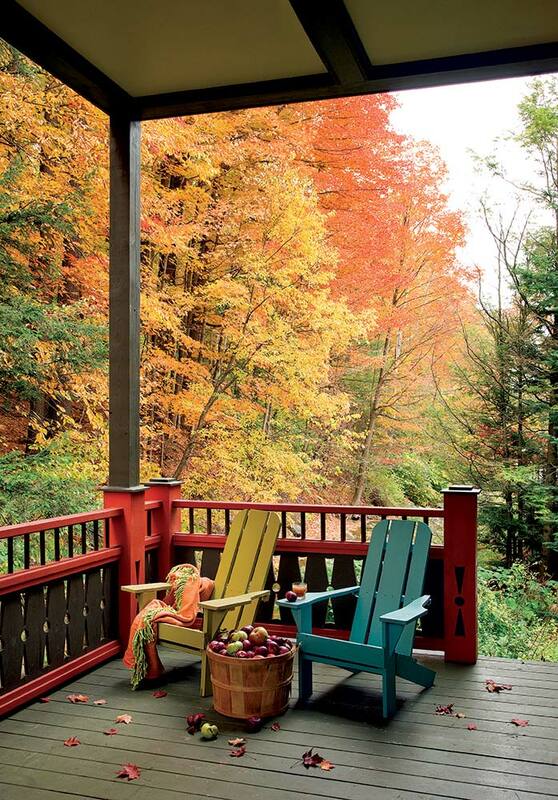 Lauren Parlin chose the vibrant paint colors for her new home and business in Hague, New York. When the youngest of Lauren and Ken Parlin’s three children had left home for college, the couple thought it was time for a lifestyle change. 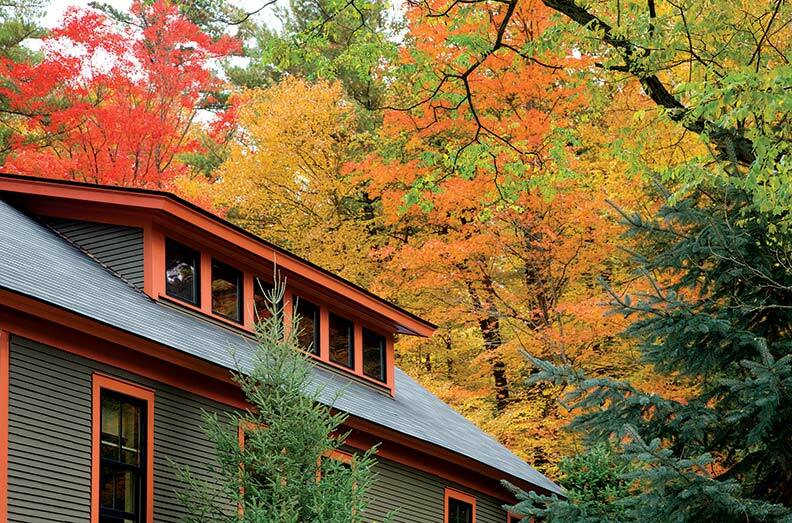 Having lived in suburban New Jersey for many years, they always felt drawn to their long-time family vacation destination in the Adirondacks. “We’d summered on Lake George and love the area,” says Lauren. One afternoon they were biking past an old general store in the hamlet of Hague—a summer community vibrant in the early 20th century—and were intrigued by its charm. “We forgot all about it until it came up for sale, and we went to take a look,” says Lauren. 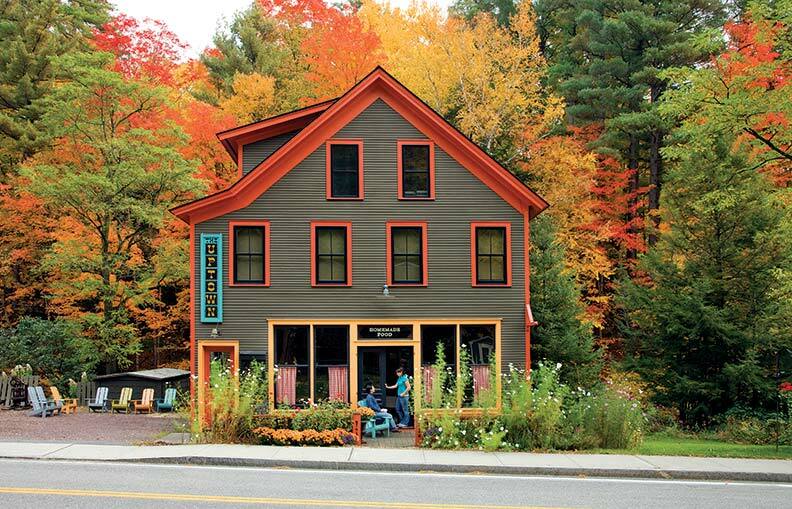 Although the original general store had been divided into four separate rooms to create a private residence, the couple’s two daughters thought it would be the perfect place for Lauren to open a café and for Ken to telecommute from. The couple put in an offer on the structure and began to look for an architect who would have the sensibilities needed to bring the charming storefront back to its roots. “I actually found Sandy Vitzthum on the web,” says Lauren. 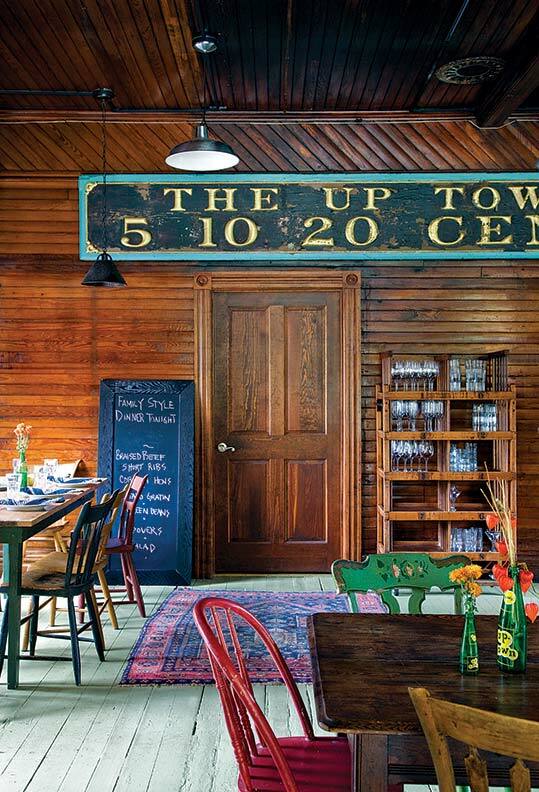 A Vermont architect, Vitzthum had the philosophy toward renovating old buildings that Lauren and Ken were looking for. Once Vitzthum was on board, the couple planned their renovation strategy. They decided to start with the first floor and turn back the clock. Although the structure originally was built as a general store in the 1880s, the building had been reincarnated several times over the years, operating as a shop, a boarding house for local miners, and even as a taxidermy. 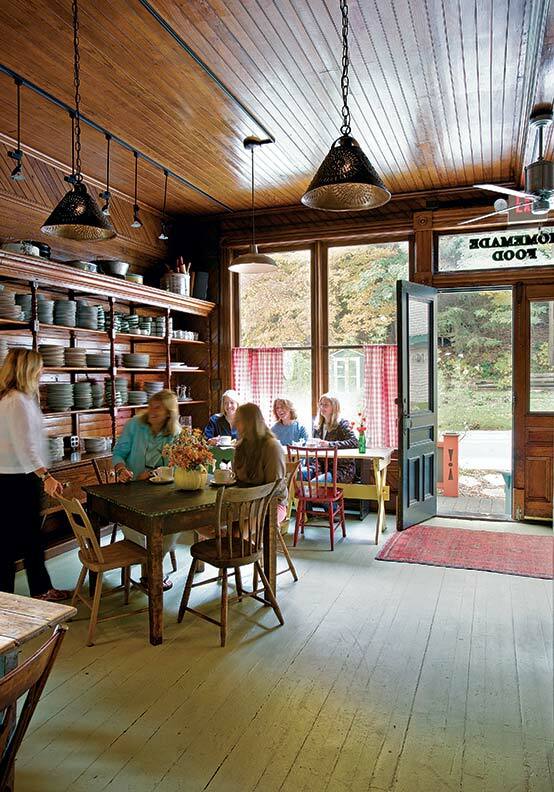 The general store&apos;s original floors were painted for easy cleaning. Many of the original design elements still existed on the main level. Intact were its open shelving and varnished plank walls. The floor was in fairly good condition as well. Vitzthum, working with contractor Tom LaPointe, removed the interior walls (leaving the support beams in place), which opened the space into one large dining room. Next, Vitzthum transformed an old shed room off the back of the general store into a commercial kitchen. LaPointe added support beams in the basement to shore up the floor to carry the weight of the commercial range. The downstairs also had to pass fire safety code, so LaPointe incorporated double layers of fire-retardant Sheetrock into the kitchen ceiling and walls. The upstairs of the building, which the couple decided to make into their home, had not weathered the years as well as the first floor. The rooms had gone through many renovations over the decades and had lost much of their original character. Dropped cork ceilings and faux paneling adorned the small “boarding house” rooms. Lauren wanted to bring the décor of the first floor into the upstairs living space. They also reconfigured the floor plan, orienting the dining room, living room, and kitchen to the back of the house, which had views of the brook and woodlands. Today these spaces open onto one another—five beams help divide the room functions. To re-create the charm of the shop upstairs, Vitzthum gutted the interiors and introduced appropriate details evocative of the space below. Horizontal and diagonal paneling was brought in as wall covering. Made of 3" fir boards, the paneling was finished with a coat of varnish to give it a warm patina. LaPointe installed new wide-plank white pine floors finished in tung oil. Vitzthum also had the windows replaced with Kolbe two-over-two sashes. She custom-designed the window muntins to match the original window profile. LaPointe salvaged as much of the interior woodwork as he could. He carefully removed and later reinstalled the window trim with bull’s-eye corner blocks. 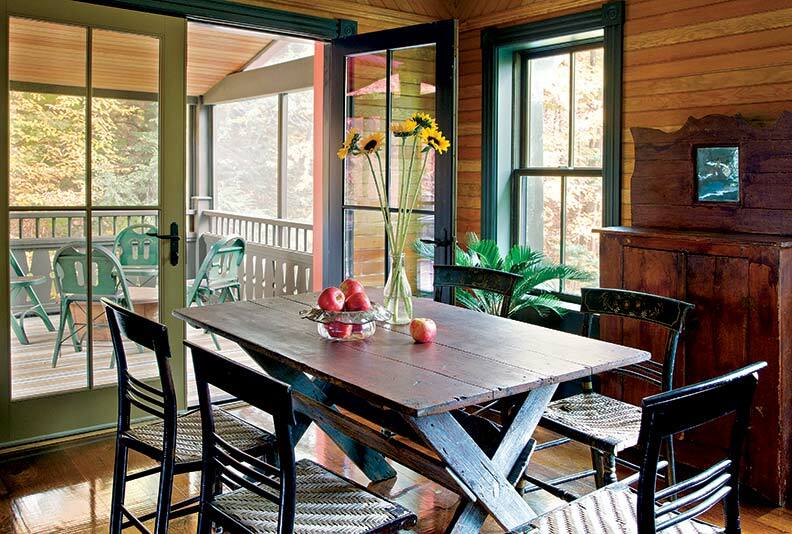 The couple&apos;s informal dining room opens onto the second-floor screened porch. Lauren also wanted to create more sleeping quarters, so Vitzthum explored how to best utilize the attic space. 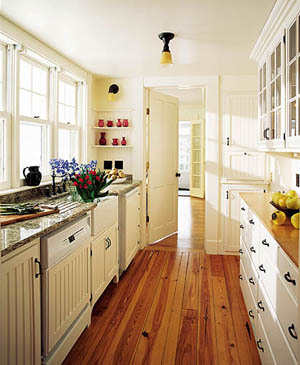 She transformed the third level by simply incorporating two shed dormers with casement windows, which provide additional space, natural light, and ventilation. In addition to re-creating the interiors and adding more bedrooms, Vitzthum added a two-story porch onto the back of the building that opens onto a bubbling brook. The screened porch off the upstairs living quarters is accessed through a set of glass doors off the dining room. “Lauren was instrumental in re-creating authentic interiors,” says Vitzthum. 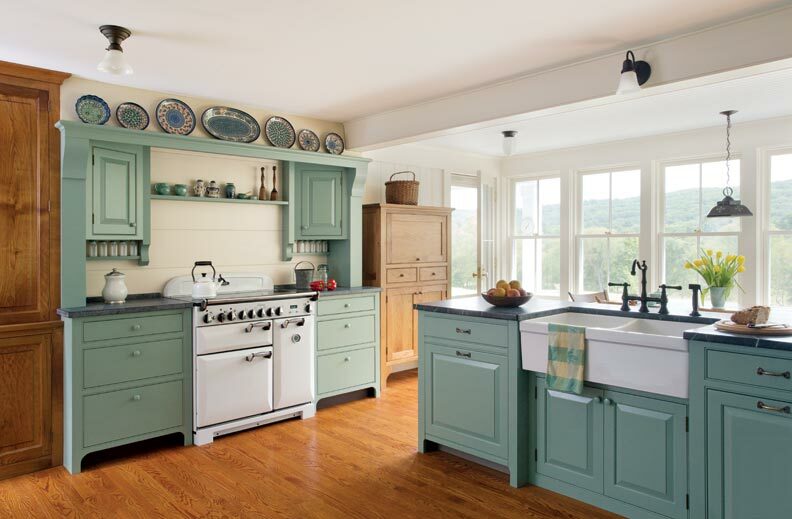 “She has a great eye and scoured salvage and antiques shops for age-appropriate items for the house.” Salvaged blackboard was transformed into the kitchen counters, an old Glenwood stove graces the kitchen, and the built-in living room cabinets are faced with antique glass cabinet doors. The new staircase leading to the third floor—which replaced an old spiral wooden staircase—has an antique newel post and several antique balusters. LaPointe turned new balusters to match the old counterparts. 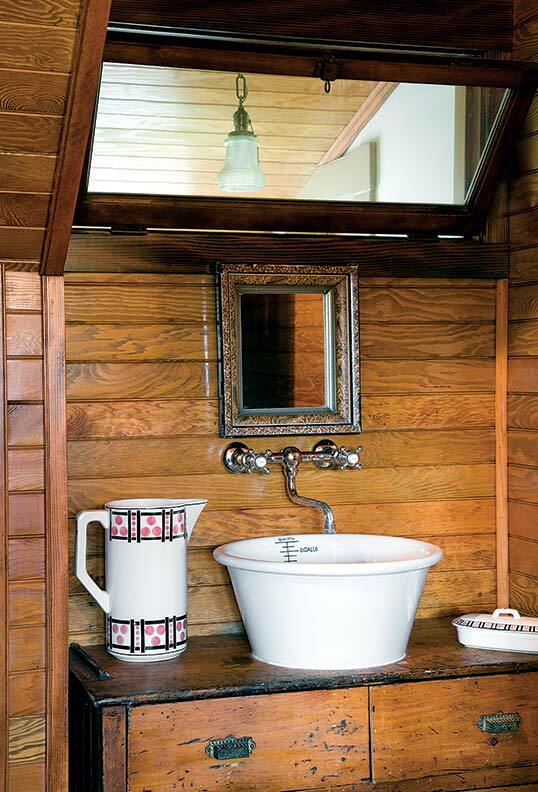 An old milk bowl became the sink basin for the bathroom. “All these pieces lend authenticity and character to the house,” says Vitzthum. Vitzthum incorporated new exterior details into the design, including a two-story porch that overlooks the brook. LaPointe introduced Charles Eastlake-inspired decorative cutout balusters to the two-story porch. He had seen the design on a hotel dating to a similar time period as the shop and felt it was an appropriate choice. To keep the proportions of a Victorian-era porch, Vitzthum chose to incorporate two railings to meet today’s height code requirements. “Older porch railings were typically 30" high, but today if you have more than a 30" drop, you have to add a 36" to 42" railing,” she explains. A simple railing tops the adorned piece strictly for safety. Lauren chose paint colors that she felt would be forgiving to the original clapboard on the house. A dark olive green with mustard and tangerine trim creates a handsome face to Uptown’s customers. Today, Lauren is chef/owner of the restaurant. It’s open during the height of the summer and fall season, when you can find Lauren greeting patrons. When the season quiets down, the couple often invites family and friends to join them for holidays. “It’s great to have a commercial kitchen and seating for 30 right in your own home,” says Lauren, who loves to entertain. The place offers the perfect environment for the couple to enjoy both their public and private realms under one roof.